Before using the interactive KayakPro Community i-Race Express racing program you need to confirm: that you accept full responsibility to use the program and that you are fit for exercise, it is your responsibility to consult with your doctor or healthcare professional to ensure you are fit enough to undertake exercise. By using KayakPro i-Race Express the user assumes and accepts full and complete responsibility for self. And for all potential and actual injury that results from undertaking strenuous exercise or by the use of the KayakPro SpeedStroke GYM Ergometer. Before Racing you should make yourself fully familiar with SpeedStroke and i-Race Express interactive website- it a self monitoring, honesty based reporting table – Sure, it is possible to cheat, by posting incorrect information. 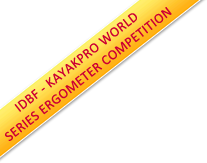 KayakPro USA LLC and this website undertake no policing or validation of the reported results. Please note the Resistance level 1-9 or the paddle shaft length does not make a difference to the distance traveled / or time results. Results are calculated on a calibrated Drag factor. To avoid over-heating it may be prudent to employ the use an air fan.